What's the Best Way to Buy Avengers: Endgame Presale Tickets? UPDATE 04/02 11 AM EDT: Are you trying (and trying) to get Endgame presale tickets and running into problems? You’re not alone, unfortunately. Scroll down to see our best practices for getting tickets if you’re running into troubles. You may have heard that Avengers: Endgame advanced tickets are going on sale this Tuesday, April 2nd, 2019 — in fact, you might have read it on our site. We previously posted about the tickets going on sale earlier than April, but this April 2nd date wasn’t complete surprise. If true, the tickets go on sale with just over three weeks before Avengers: Endgame officially releases in theaters on April 26th. Now that the endgame is near, you’ll finally know the time and place you’ll be watching Endgame on the last Friday of the month. That’s all good and fine, but knowing the date is only half the battle. Considering the scale and scope of the movie event — likely going to be one of the biggest movies of all time — how and where can you buy pre-sale tickets so you can secure your seats for the epic finale to the first ten years of Marvel movies? First and foremost, you could choose to go old-school and wait outside your local theater to buy the advanced tickets, but unless you live right next door to an AMC it might not be your best use of your time. And time is of the essence here. You also need to take into consideration the reportedly 8 AM ET go live (5 AM PDT), your theater won’t even be open. That said, we recommend you go online if you want the best seats to the fourth installation of Avengers. It is 2019, after all. Now that your calendar is marked for April 2nd early-morning, take it the next step and plan out which showtime you (and your friends prefer) so you’re best ready to snag the best seats tomorrow morning. That’s because all the major movie theater companies and ticket distributors have already published their showtimes for Avengers: Endgame. The list includes the biggest movie theater chains in AMC Theatres and Regal as well as ticket distributors Fandango and Atom Tickets. A part of the fun of attending Marvel movies, Star Wars films, Harry Potter-like franchises and other major film events is consuming as much information (without spoilers) prior to the movie’s release and the process of snagging the best tickets to opening weekend. Come April 3rd, you’ll be locked and loaded. It’ll be a waiting game as you stock up on Endgame t-shirts and re-watch all 48 hours of Marvel films leading up to Avengers: Endgame. Good luck tomorrow morning. Trouble Buying Avengers: Endgame Tickets? As we mentioned in this post, Thanos hasn’t just wiped out 50% of the populations but his snap has eliminated AMC, Fandango, Atom Tickets and other movie ticket distributors for a good chunk of the movie ticket-buying public. We detailed out in that post that the sites and apps are being hit hard by fans that can’t wait past the opening weekend to see what happens after the Infinity War sequel. So you can’t find tickets? Here’s some tips that might help. 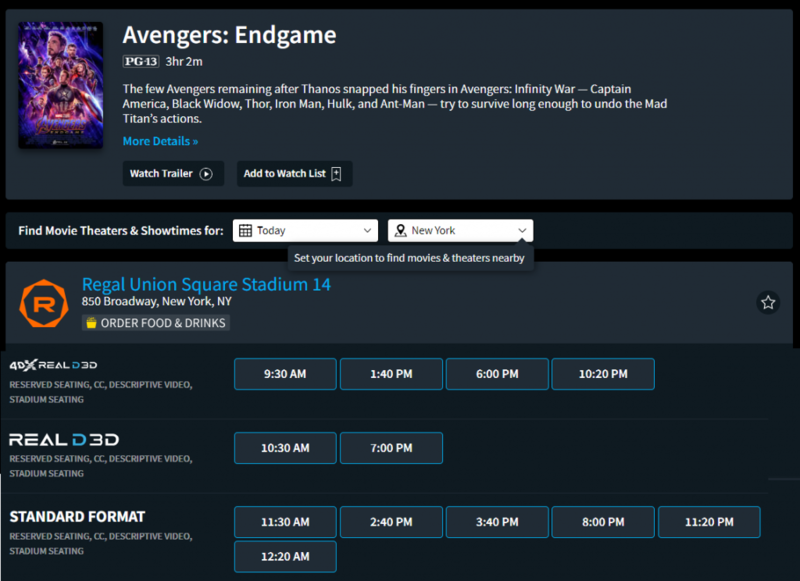 Nothing is promised, but heeding these best practices will help you get advanced tickets to Avengers: Endgame during it’s opening weekend. We’ve looked into 14,000,605 futures and this is your best chance of seeing the blockbuster in the theatres come the end of April. Shop the Avengers: Endgame t-shirt, the graphic hoodie sweatshirt (it comes in five colors) or movie logo long sleeve tee on Amazon.